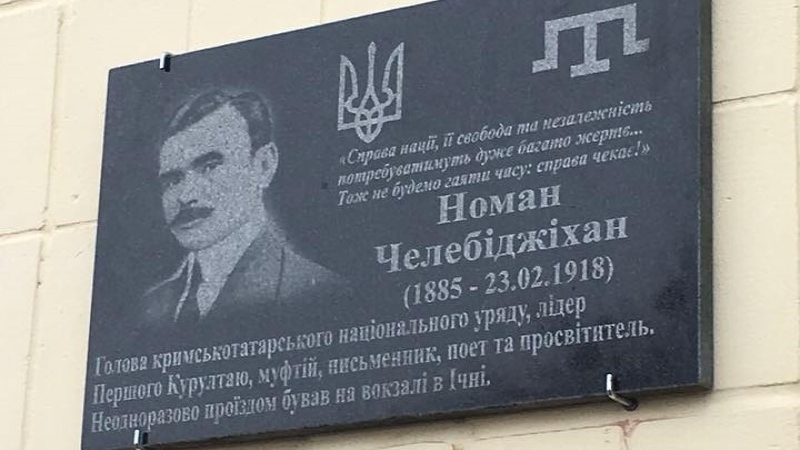 In Ichnia, Chernihiv region of Ukraine, a memorial plaque was opened for the first Mufti of the Muslims of Crimea, Lithuania, Poland, the initiator of the First Qurultay of the Crimean Tatar people, the first Head of the Crimean People's Republic, Noman Çelebicihan, the QHA correspondent reports from the scene. The memorial plaque was placed on the wall of the railway station building. The opening ceremony was attended by Deputy Head of the Mejlis of the Crimean Tatar people Ilmi Umerov, Deputy Minister of Information Policy Emine Dzhaparova, and the officials of the Chernihiv Regional Administration. “Noman was killed at the age of 33. In 1918, the Bolsheviks shot him in a Sevastopol prison. The Soviet period diluted many historical facts. His name was not mentioned anywhere, at any time, but for the Crimean Tatars he was a symbol and an example to be followed. But we have claims to the Russian Federation not only for the events of a hundred years ago. Back in 1781 the first annexation of the Crimea took place, and since then our troubles have not stopped. The desire to destroy our unconquered people does not leave the Russian tsars. And the last Russian tsar, Putin, is now going to become a president of the Russian Federation again,” Umerov said. According to the Head of the Ukrainian Initiative NGO Yuri Kostenko, Noman Çelebicihan came at the station in Ichnia during his trips to St. Petersburg. “In the 1912-1917 years he went to St. Petersburg first to study, and then on business. At that time the trains stopped here for a longer time and he had the opportunity stroll along the platform. The name Ichnia is of Turkic origin, and this influenced the fact that Noman drew attention to our city," he said. On Friday, February 23, Kyiv will host a tournament on the national Crimean Tatar wrestling kuresh, dedicated to Noman Çelebicihan.